The key here, as in my last post, is starting off the recipe by cooking a batch of thick-sliced bacon and reserving the leftover fat for…well, every other part of the recipe. 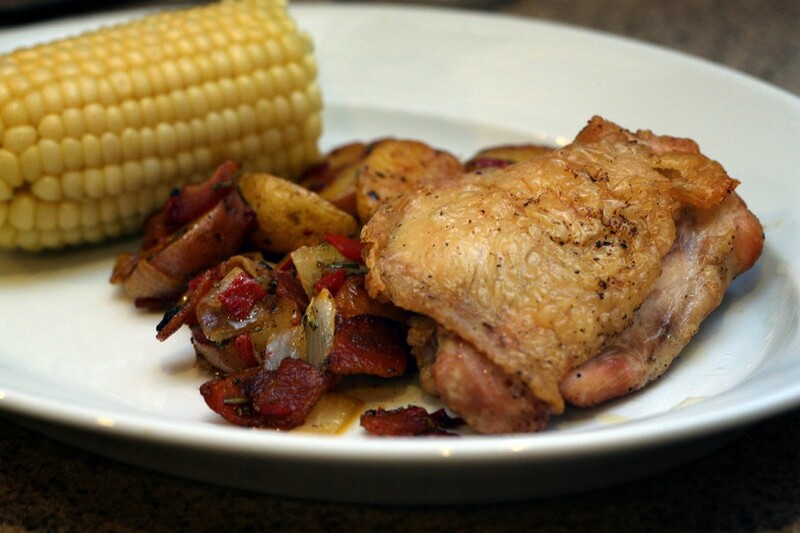 After cooking the bacon, the chicken gets a quick browning in the grease, and then the potatoes are tossed in whatever bacon and chicken fat is left in the pan. It sounds like a lot of fat. It probably is a lot of fat. It’s damn tasty. This recipe is adapted from Lidia Bastianch’s book, Lidia’s Family Table, and the recipe there is itself an adaptation of her own mother’s chicken and potatoes recipe. She cooks the entire meal in a single skillet, but I find it’s easier and more reliable to use a pan to get everything started and then finish the rest on the oven, even if it means getting a few more sheet pans dirty. Clean-up is pretty simple with this one. 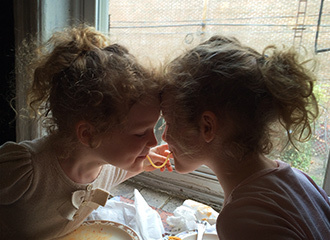 As for that Willa and Phoebe test: they ate the chicken, of course had the bacon, tried some potatoes, accidentally ate some onions without noticing, and steered clear of the peppers. A moderate success, and definitely worth another try! Season your chicken pieces with the salt and pepper in a bowl. I like to do this in the morning so that the seasonings really penetrate the meat as a sort of "dry brine." Just cover and place the chicken in the fridge for the day. In a large heavy-bottomed sauté pan or cast-iron skillet, cook the bacon pieces over medium heat until crispy, then remove the pieces with a slotted spoon to a plate lined with paper towels. Add the olive oil to the pan, and brown your chicken pieces, skin-side down, around ten minutes. Flip your pieces to give the other side a sear and remove after 2 to 3 minutes to foil-lined sheet pan, with a rack. Do this in two batches if necessary. Remove the pan from the heat, and place the chicken in the oven on the top rack to finish cooking. Carefully add the potatoes, onions, rosemary, and peppers to the pan in which you cooked the bacon and chicken. Mix this up and try to scrape as much of the pan drippings from the bottom as possible. Allow to cool enough to handle, then transfer this mix to another sheet pan lined with parchment paper. Adjust all the potatoes so that they are cut-side down, and even out all the other ingredients so that they are in contact with the pan as much as possible. Place this pan in the oven on the lower rack. You'll need to watch the timing here. The chicken probably needs another 20 to 30 minutes to finish cooking, depending on how well they were browned in the pan and size of the pieces. The onions and potatoes should take 25 to 35 minutes—they are finished when the potatoes are browned and easily pierced with a knife or fork. It's okay if the chicken finishes a little early; remove it from the oven and allow the meat to rest a bit. Once the potatoes are fully cooked, remove the pan from the oven, add the reserved bacon pieces, and give it all a good mix. To serve, put the potatoes/onions/bacon/peppers on a serving platter, topped with the chicken. * Yes, you can use chicken breast here, but keep an eye on the cooking time—they will cook faster than the thighs or legs. And please, keep the skin on. Live a little.